Defensive End George Selvie Visits New York Giants: According to The Bergen Record, unrestricted free agent defensive end George Selvie (Dallas Cowboys) is visiting the New York Giants today. The 28-year old Selvie was a collegiate teammate of defensive end Jason Pierre-Paul at the University of South Florida. He was drafted in the 7th round of the 2010 NFL Draft by the St. Louis Rams. Since that time, he has played with the Rams (2010), Carolina Panthers (2011), Jacksonville Jaguars (2011-12), and Cowboys (2013-14). Selvie also worked out for the Giants at a mini-camp in 2013 but was not signed and then signed with the Cowboys. He started 29 regular-season games for Dallas in the last two years, accruing 75 tackles and 10 sacks. Selvie has good size (6’4”, 270 pounds). He is a solid run defender who flashes at times in the pass rush, particularly in 2013 when he registered seven sacks. 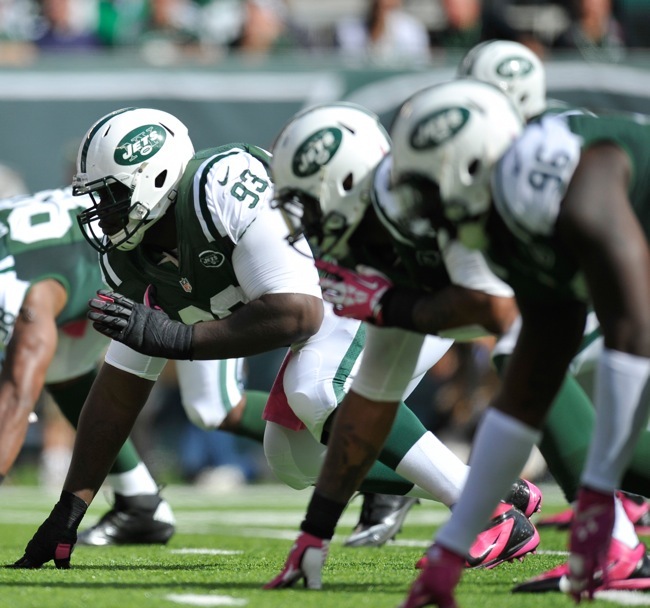 New York Jets Sign Offensive Lineman James Brewer: The New York Jets have signed unrestricted free agent offensive lineman James Brewer (New York Giants) to a 1-year contract. Brewer did not develop as a player after being drafted in the 4th round of the 2011 NFL Draft by the Giants. A year after playing in all 16 games with eight starts in 2013, Brewer only played in two games in November before being placed on injured reserve in December with a concussion. Brewer is the third Giant to depart the team in free agency this offseason. Safety Antrel Rolle signed with the Chicago Bears and cornerback Walter Thurmond signed with the Philadelphia Eagles. For a list of all of the Giants free agents, see the 2015 Free Agency Scorecard section of the website. Roster Page Updated With New Football Jersey Numbers: Most of the new Giants and many veteran Giants have been issued their football jersey numbers. Check out the site’s Roster page for details. The overall play of the New York Giants offensive line improved in 2014 from its dreadful performance in 2013 but the unit was still sub par. The Giants were tied for 28th in the NFL with only 3.6 yards per rushing attempt. 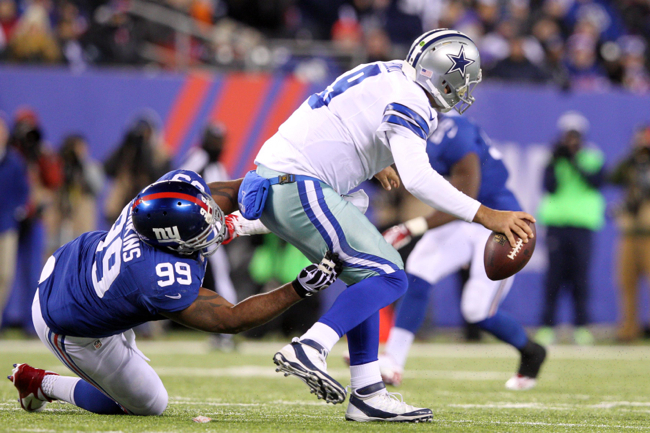 Pass protection was better as the Giants gave up 30 sacks on the season, which was 9th-best in the NFL. But that figure is a bit misleading given the offense’s new emphasis on getting rid of the ball quickly (West Coast Offense) and quarterback Eli Manning’s long-established tendency to get rid of the ball quickly not take the sack, which he probably actually should do more often when under duress. The improvement that did take place not only had to do with the individual components playing better, but the Giants had greater cohesion up front due to far fewer injuries. In 2013, the Giants used seven different starting offensive line combinations, the second-highest total in the NFL that season. In 2014, the same players started all 16 games at left tackle (Will Beatty), center (J.D. Walton), and right guard (John Jerry). 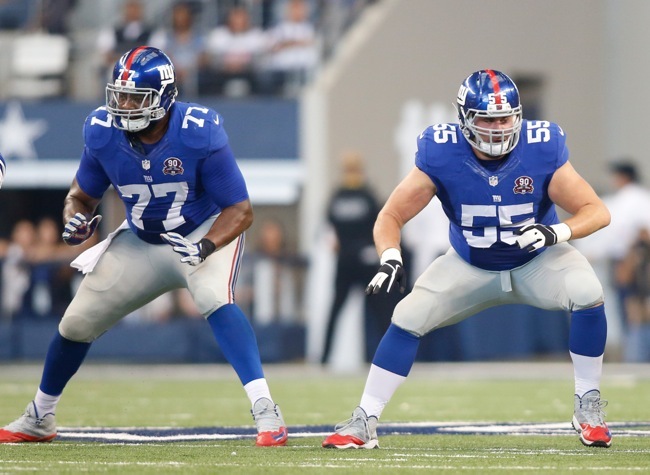 Weston Richburg started 15 games at left guard and Justin Pugh started 14 games at right tackle. In 2013, not only were the Giants continually shifting players around due to an inordinate number of injuries to starters, but they were sometimes relying on third-stringers as backups were also getting injured. That all said, it is widely-recognized that the offensive line was once again a sore spot in 2014. The Giants counted on high-priced free agent acquisition Geoff Schwartz to be a major building block, but Schwartz only played in two games due to injuries. Chris Snee, who the Giants never really counted on, retired before training camp. Overall, the line is more finesse than power, which usually is not good for any offense, but especially so for one predicated on balance and the ability to run the football. Another issue is the poor overall depth situation. For years now, the Giants have not had quality up-and-coming reserves waiting in the wings in case the starters faltered or got hurt. Questionable free agent decisions and shoddy drafting have been the primary culprits. Most of the offensive linemen drafted in recent years have not developed, including Mitch Petrus, James Brewer, Brandon Mosley, and Eric Herman. Will Beatty started all 16 games at left tackle. He rebounded from a terribly inconsistent 2013 and a fractured tibia that he suffered in the regular-season finale at the end of that year to have a mostly positive performance in 2014. Since Beatty was drafted in the 2nd round of the 2009 NFL Draft by the Giants, Beatty has had issues staying healthy, including a broken foot in 2010, a detached retina in 2011, a back injury that caused him to miss offseason work in 2012, and the broken leg in 2013. Beatty is a big lineman with long arms and a very good athlete. When on top of his game, Beatty can mirror and slide with the best pass rushers, and is athletic enough to pull and engage defenders at the second level in the run game. However, Beatty is more of a finesse player. He does not play with a lot of strength and power and he is not a very physical or aggressive blocker. Beatty still has consistency issues. The Giants drafted Weston Richburg, a 4-year starter at center in college, in the 2nd round of the 2014 NFL Draft. 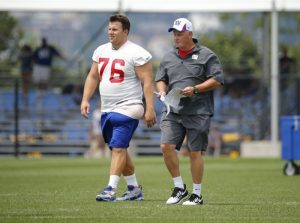 Most of his practice reps with the Giants came at guard in training camp and when Geoff Schwartz suffered a preseason toe injury, Richburg became the starter at left guard. He started 15 games at the position, being benched for one game in November. Richburg had an inconsistent year as a rookie as both a run and pass blocker. Richburg is a good athlete with decent size, but he needs to get bigger and stronger. He is not a mauling type of lineman, but he plays with good leverage and tenacity. Mobile and agile, Richburg, can block at the second level and pull on outside runs. He is smart, tough, and aggressive. His best position is most likely center though he is obviously versatile enough to play guard. J.D. Walton started all 16 games at center for the Giants in 2014, but his play was sub par. Walton was originally drafted in the 3rd round of the 2010 NFL Draft by the Denver Broncos. He started 32 regular-season games in 2010 and 20011 and the first four games of 2012 until he missed the rest of the season with a severe left ankle injury that required surgery. Walton had a setback on the ankle during the following offseason and underwent a second surgery in June 2013. He missed all of training camp and the preseason and was placed on the Physically-Unable-to-Perform (PUP) List. The Broncos waived him in December 2013 and Walton was then claimed off of waivers by the Redskins. The Giants signed him in March 2014. Walton has average size and athletic ability for a center. He does not generate much movement in his run blocks and can be physically overpowered by bigger, stronger linemen. Walton is a better pass protector but he is vulnerable to powerful or quicker linemen in that area as well. The strength of Walton’s game is his intelligence, scrappiness, and effort. The Giants were comfortable with him making all of the offensive line calls. John Jerry started all 16 games at right guard for the Giants in 2014. He was a wildly inconsistent player who alternated far too much between solid and poor play. 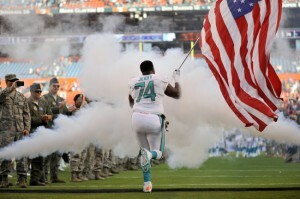 Jerry was originally drafted in the 3rd round of the 2010 NFL Draft by the Dolphins where he started 45 games in his first four seasons in the NFL. The Giants signed Jerry as an unrestricted free agent in March 2014. Jerry looks the part with very good size and long arms, and he flashes both as a run and pass blocker. But he simply is not consistently reliable, technique-oriented, and physical enough blocking for both the run and the pass. Simply put, Jerry needs to work harder at keeping his opponent from making the play. He also seemed to struggle at times mentally with recognizing stunts and blitzes in pass protection. In his second season with the Giants after being drafted in the 1st round of the 2013 NFL Draft, Justin Pugh regressed a bit and had an inconsistent season at right tackle. Sporting a brace on his left elbow, Pugh struggled in the first half of the season and then missed two games with a quadriceps injury in November. He played much better in the final four games in December. In 2013, Pugh started all 16 games at right tackle and was voted to the Pro Football Writers All-Rookie Team for his performance. Pugh doesn’t look the part as he lacks ideal size and has short arms for a tackle. But he is a good athlete who plays with fine strength, technique, and leverage. Pugh is smart, aggressive, and tenacious. Though not a mauler, he can get movement on his run blocks and he has the agility to do well in pass protection, though he needs to become more consistent in that area. He can pull and block defenders at the second level. Versatile, the Giants think he can play both tackle spots, guard, and possibly even center. In his first season with the Giants, Geoff Schwartz suffered through an injury-plagued season that saw him play in two games at right tackle because of serious toe and ankle injuries that both required surgery. He missed both the first 10 and last four games of the season, ending up on Injured Reserve in December. Schwartz was originally drafted in the 7th round of the 2008 NFL Draft by the Carolina Panthers. He has spent time with the Panthers (2008-10), Vikings (2012), and Chiefs (2013). He signed with the Giants as a free agent in March 2014. Schwartz has excellent size and can maul people as a run blocker. He is very solid in pass protection. Schwartz is versatile – he is able to play guard or right tackle. 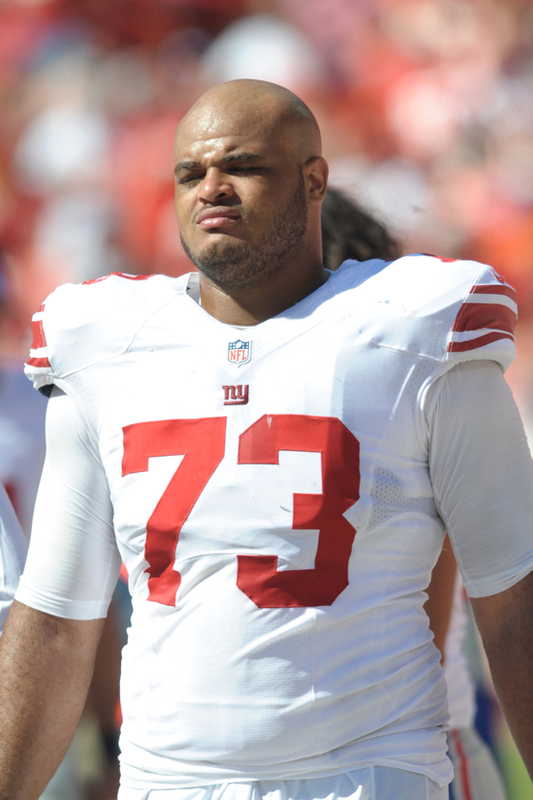 James Brewer simply has not developed as a player since being drafted in the 4th round of the 2011 NFL Draft by the Giants. A year after playing in all 16 games with eight starts, Brewer only played in two games in November before being placed on injured reserve in December with a concussion. Brewer has a nice combination of size and athleticism. He can play both tackle and guard spots. However, he has not proven to be a very tough or physical lineman. Adam Snyder was signed by the Giants in September 2014. He played in four games with one start at left guard in Week 12 before leaving that game with the knee issue that caused him to be placed on Injured Reserve in December. Snyder was originally drafted in the 3rd round of the 2005 NFL Draft by the San Francisco 49ers. During his career, he’s played eight seasons with the 49ers (2005-11, 2013) and one with the Arizona Cardinals (2012). Snyder is extremely versatile, having starting experience at all five offensive line positions. He has started 88 regular-season games in 10 NFL seasons. However, despite having very good size, Snyder was considered the weak link of the starting units in San Francisco and Arizona in recent years. Brandon Mosley has not developed since he was drafted in the 4th round of the 2012 NFL Draft. He missed his entire rookie season with an ankle injury. Mosley was active for 22 games the last two seasons, including nine in 2014. His only start came late in the 2013 season. Mosley has good size and athletic ability. He is also versatile, having experience at both guard and tackle. But on a weak offensive line, he has not been able to gain any serious playing time. Dallas Reynolds was active as a reserve linemen in 15 games in 2014, but he did not start. Reynolds was originally signed by the Philadelphia Eagles as an undrafted rookie free agent after the 2009 NFL Draft. He spent time on the Eagles’ Practice Squad from 2009-11. In 2012, Reynolds played in 16 regular-season games with 14 starts. The Eagles waived him August 2013 and he was signed by the Giants in October of that year. A limited athlete with good size, Reynolds is smart and tries hard. He has experience at both center and guard, but he has struggled when called upon to play. Eric Herman added to the 53-man roster in December 2014 from the Practice Squad, where he spent the bulk of the season. He was also suspended for the first two games of the 2014 season for violating the NFL’s policy on performance-enhancing drugs (PEDs). Herman was drafted in the 7th round of the 2013 NFL Draft by the Giants. He spent most of his rookie season on the Practice Squad until being also added to the roster in December 2013. Herman is a big, strong mauler who struggled with quickness and speed at the collegiate level. Herman needs to develop as a pass blocker in order to make it in the NFL. Adam Gettis was signed to the 53-man roster from the Practice Squad of the Pittsburgh Steelers in December 2014. Gettis was originally drafted in the 5th round of the 2012 NFL Draft by the Washington Redskins. The Redskins waived Gettis in August 2014 and he was signed the Steelers’ Practice Squad in October. Gettis lacks ideal size, but he is athletic. Rogers Gaines was waived/injured and then placed on Injured Reserve with a shoulder injury in August 2014. Gaines was originally signed by the Baltimore Ravens as an undrafted rookie free agent after the 2013 NFL Draft. The Ravens waived him in August 2013. The Bears signed him to their Practice Squad in September 2013. The Giants claimed Rogers Gaines off of waivers from the Chicago Bears in May 2014. Gaines has excellent size and long arms. He is a good athlete for his size. He improved throughout the 2014 preseason at right tackle for the Giants. Troy Kropog was placed on Injured Reserve in August 2014 with a foot injury that he suffered in training camp. Kropog was originally drafted in the 4th round of the 2009 NFL Draft by the Tennessee Titans. The Titans waived him in September 2012 and he then spent time with the Jaguars (2012), Vikings (2012-13) and Redskins (2013). The Giants signed Kropog to a reserve/future contract in January 2014. Kropog has a decent combination of size and athleticism, and he is a hard worker. Versatile, he can play both tackle and guard. But it hasn’t come together for Kropog at the NFL level and he has never started a regular-season game. Michael Bamiro was signed to the Practice Squad in November 2014. Bamiro was originally signed as an undrafted rookie free agent by the Philadelphia Eagles after the 2013 NFL Draft. He spent the 2013 season on the Eagles’ Practice Squad before being waived in August 2014. Bamiro is a very raw player with an intriguing combiation of size (6’8”, 340 pounds) and overall athleticism. Giants Place Jacquian Williams and James Brewer on Injured Reserve: The New York Giants placed linebacker Jacquian Williams (concussion) and offensive tackle James Brewer (concussion) on season-ending Injured Reserve on Tuesday. Williams has missed the last five games and Brewer the last two games with their injuries. The Giants now have 22 players on Injured Reserve. To fill those vacant roster spots, the Giants signed defensive tackle Dominique Hamilton from the team’s Practice Squad and offensive lineman Adam Gettis from the Pittsburgh Steelers’ Practice Squad. Hamilton originally signed with the Oakland Raiders as an undrafted rookie free agent after the 2012 NFL Draft. The Raiders cut him and he was on NFL practice squads in 2012 (Redskins) and 2013 (Redskins and Chiefs). The Chiefs waived him in August 2014 and the Giants signed him to the Practice Squad in September. He spent a few days on the 53-man roster in early December but has not played in a game this year. Gettis was originally drafted in the 5th round of the 2012 NFL Draft by the Washington Redskins. The Redskins waived Gettis in August 2014 and he was signed the Practice Squad of the Pittsburgh Steelers in October. Gettis lacks ideal size, but he is athletic. The Giants also signed safety Thomas Gordon to the Practice Squad. Gordon was signed by the Giants as a rookie free agent after the 2014 NFL Draft, but the team waived him at the end of August. Because of these moves, we have updated the Roster, Depth Chart, and Transactions sections of the website. Sights and Sounds from Giants-Redskins Game: A sights and sounds video from the Giants-Redskins game is available at Giants.com. Notes: WR Odell Beckham had 23 combined receptions vs. Tennessee and Washington, the highest two-game total in Giants history. Beckham is the first Giant and the first NFL rookie with at least 12 catches, 140 receiving yards and three touchdown catches in a game. 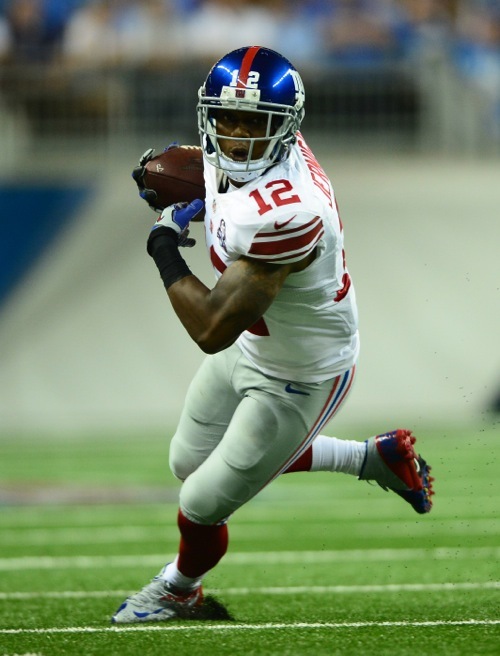 Beckham has three games this season in which he caught at least 10 passes and gained at least 130 yards. No other rookie in NFL history has even two such game. 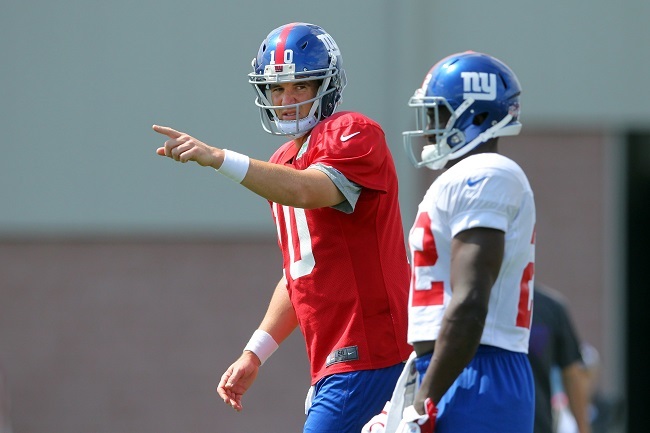 With the New York Giants reporting to training camp in less than two weeks, BigBlueInteractive.com is breaking down each of the team’s positional groups from now until July 21. Today, let’s take a look at the offensive line. ADDITIONS/SUBTRACTIONS: With how terrible things were last year, changes up front were inevitable. Kevin Boothe left for Oakland, David Baas was released and David Diehl retired. The Giants signed notable free agents: J.D. Walton (C), Geoff Schwartz (G), John Jerry (G) and Charles Brown (T) while drafting Weston Richburg (C/G) in the second round. It was a complete and much-needed overhaul. TRAINING CAMP STORY LINES: While there are many, the health of guard Chris Snee tops the list. Since being drafted out of Boston College, Snee has been a staple on the Giants’ line and considered one of the best guards in the NFL. But the years in the trenches have taken their toll on the 32-year-old. His 6-3, 310-pound frame is bruised and battered and Snee’s hardly the player he was when entering the league over a decade ago. When the Giants reported for their offseason conditioning program, Snee was a full participant, but that quickly changed. His elbow flared, sidelining Snee for the majority of the workouts. Even when Snee is healthy, he isn’t the same player he used to be. The fact he’s already being held out of non-contact practices doesn’t bode well. Will Snee make it out of training camp? Will he hang up the cleats? If he realizes he can no longer play, who steps up at right guard? There are many questions on the Giants’ offensive line (William Beatty), but many center around the health of Chris Snee. ON THE BUBBLE: Two names truly stick out: John Jerry and James Brewer. Since being considered an up-and-coming lineman for the Giants, James Brewer has yet to capitalize on the opportunities the team has given him. Now, he finds himself working with the third unit and his days in blue may be numbered. Jerry, meanwhile, is waiting to hear on his punishment for his involvement in the Miami Dolphins bully scandal. There’s a lot of hype around Jerry and talk he could be perfect in the Giants’ scheme, but his baggage may be enough to have the Giants pull the plug before even flipping the switch. 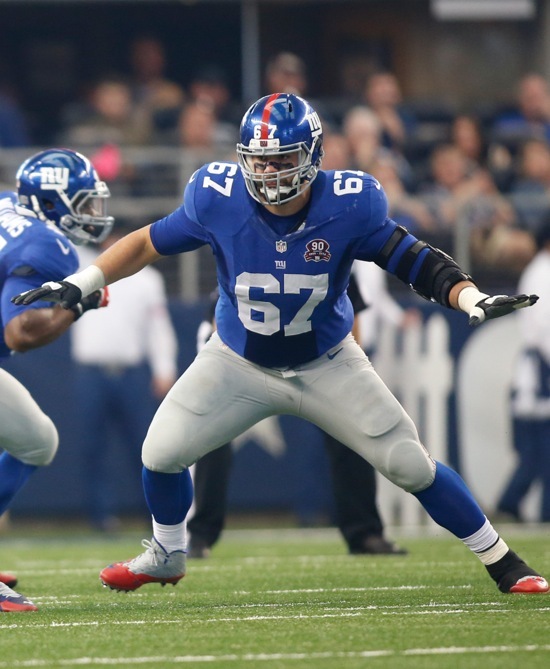 Connor Hughes – I’m just not sold on the Giants’ offensive line yet. I like the addition of Geoff Schwartz, but that solidifies one of the five question marks from left to right. Of every player that could step foot on the field to protect Eli Manning, I have faith in two: Justin Pugh and Schwartz. J.D. Walton has battled injuries, William Beatty is a huge question mark, who goes for Snee if/when he can’t? John Jerry wasn’t exactly a stud in Miami, Brandon Mosley and others on the line haven’t shown much. The Giants made their splashes in free agency and the draft on the offensive side of the ball, adding weapon, after weapon, after weapon…but none will matter if Eli Manning isn’t protected. Last year, Manning ended up injured in the final game of the season. There’s a big part of me that believes he could end up with the same fate far sooner in 2014. Eric Kennedy – I have to disagree with Connor a bit here and say the #1 question mark on the offensive line – and one of the top three question marks for the entire team – is Will Beatty. Coming off of a fractured leg and possibly an undisclosed knee injury, it remains to be seen when Beatty will be able to practice with the revamped first-team offensive line. He needs the practice. 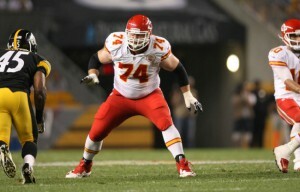 Not only to rebound from a very poor 2013 campaign, but also to develop chemistry and cohesion with LG Geoff Schwartz. 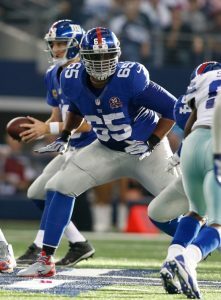 The Giants can survive without Chris Snee, I’m not sure they can perform well without Beatty returning to his 2012 form. The “wild card” here is Charles Brown. He has talent, but was very inconsistent at left tackle in New Orleans. My prediction is that J.D. Walton turns out to be a much more valuable addition to the team than many initially thought. He is a no-nonsense guy who will get the job done and bring some leadership to the unit. Walton and Geoff Schwartz will settle down the middle of the offensive line. I also look for Brandon Mosley to develop and possibly challenge for a starting spot. Connor Hughes – William Beatty (LT), Geoff Schwartz (LG), J.D. Walton (C), John Jerry (RG), Justin Pugh (RT). Eric Kennedy – Will Beatty (LT), Geoff Schwartz (LG), J.D. Walton (C), Chris Snee (RG), Justin Pugh (RT). (I also think John Jerry, Charles Brown, Weston Richburg, and Brandon Mosley make the team). New York Giants Complete First OTA Practice: The New York Giants held their first of 10 Organized Team Activity (OTA) practices on Wednesday. No live contact is allowed in OTA practices, but 7-on-7, 9-on-7, and 11-on-11 drills are permitted. RB David Wilson, who is recovering from career-threatening offseason neck surgery, did participate in the non-contact drills. Wilson worked both at running back and returner. New Offensive Coordinator Ben McAdoo’s offense is reportedly an up-tempo West Coast Offense-style of attack. McAdoo was said to be very hands-on during the drills. With LT Will Beatty still recovering from a broken leg, the first-team offensive line had James Brewer at left tackle, Geoff Schwartz at left guard, J.D. Walton at center, Chris Snee at right guard, and Justin Pugh at right tackle. The second unit had Charles Brown at left tackle, Brandon Mosley at left guard, Dallas Reynolds at center, Weston Richburg at right guard, and Troy Kropog at right tackle. Video and pictures from today’s OTA practice are available from Giants.com. The media, including BigBlueInteractive.com, will be granted access to Thursday’s practice. The offseason program will culminate on June 17-19 with a mandatory, full-team mini-camp. Day one of OTA's in the books. Love my new home! Felt awesome being able to put on the @Giants helmet for the first day of OTAs! Giants.com Q&A With RB Rashad Jennings: The video of a Giants.com Q&A session with RB Rashad Jennings is available at Giants.com. 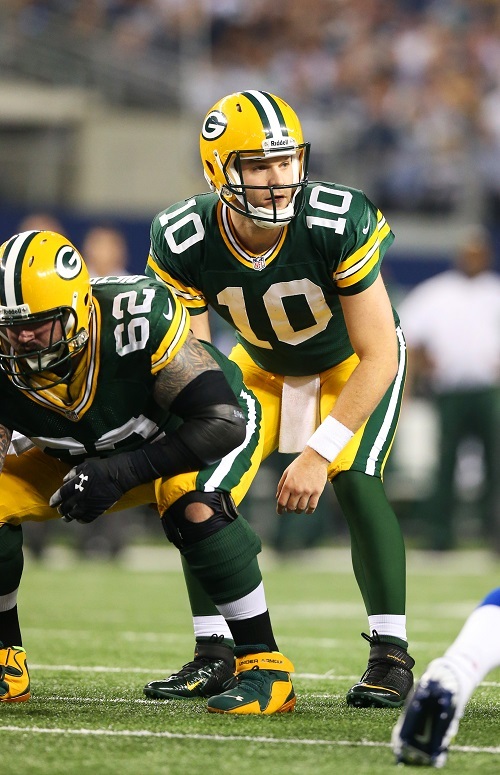 New York Giants Interested in Matt Flynn: According to The New York Daily News, the New York Giants are interested in unrestricted free agent quarterback Matt Flynn and may schedule a work out with him. The 28-year old Flynn was originally drafted in the 7th round of the 2008 NFL Draft by the Green Bay Packers. After four seasons in Green Bay, Flynn then signed with the Seattle Seahawks in 2012, was traded by the Seahawks to the Oakland Raiders in April 2013, released by the Raiders in October 2013, signed by the Buffalo Bills in October 2013, released by the Bills in November 2013, and re-signed by the Packers in November 2013. Flynn started five games in 2013, one for Oakland and four for Green Bay. He finished the season 124-of-200 (62 percent) for 1,392 yards, eight touchdowns, and five interceptions. Flynn has average size and arm strength. Current Giants’ offensive coordinator Ben McAdoo was with Flynn in Green Bay from 2008-2011 when McAdoo was Green Bay’s tight ends coach. Quarterback Eli Manning underwent arthroscopic surgery on his left ankle on Thursday. Manning is not expected to be able to run for at least six weeks. Team sources have told The New York Daily News that Manning may be limited or even held out of the ten Organized Team Activity (OTA) workouts (various dates from May 28-June 13) and the full-team mini-camp (June 17-19). Manning is expected to return to the practice field when training camp begins in late July. New York Giants 23 – Detroit Lions 20 (Overtime): The New York Giants defeated the Detroit Lions 23-20 in overtime on Sunday at Ford Field in Detroit, Michigan. With the win, the Giants improved their overall record to 6-9. The Giants also knocked the Lions out of playoff contention. Behind a patchwork offensive line and missing WR Victor Cruz, the Giants used some creative offensive play-calling and strong defense in the first half to take a 13-3 halftime lead. Detroit began the game with a 10-play, 39-yard drive that stalled at the Giants’ 45-yard line after DE Mathias Kiwanuka sacked QB Matthew Stafford for a 12-yard loss. 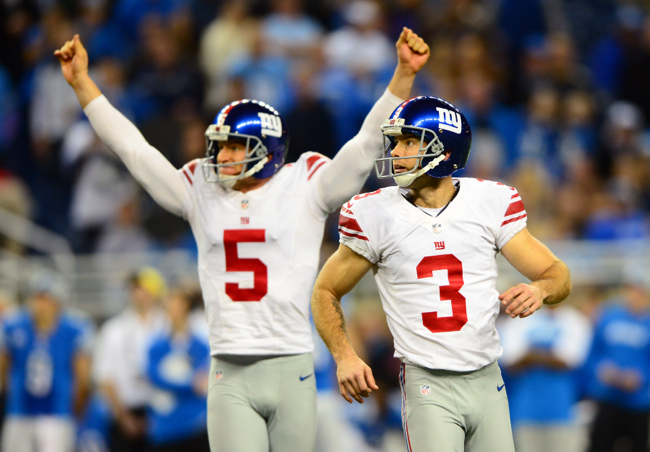 The Giants then began a 15-play, 69-yard drive that ended with a 41-yard field goal by PK Josh Brown. The two opening possessions took more than 11 minutes off of the clock. Detroit responded with another long possession, driving 63 yards in 12 plays to set up a 37-yard field goal. Early in the second quarter, the game was tied 3-3. The Giants went three-and-out on their second possession. Detroit drove from their own 35 to the Giants’ 45-yard line. But on 2nd-and-10, Kiwanuka forced RB Reggie Bush to fumble. The loose ball was recovered by S Antrel Rolle and returned to the Detroit 49-yard line. The Giants then put together a 9-play, 49-yard drive that resulted in a 20-yard touchdown pass from QB Eli Manning to WR Jerrel Jernigan. Giants 10 – Lions 3. The Lions moved to the Giants 43-yard line on their fourth offensive possession, but on 2nd-and-17, DE Justin Tuck intercepted a Stafford pass with 47 seconds to go before halftime. Despite a sack, the Giants were able to get into field goal range and Brown kicked a 52-yarder with nine seconds left on the clock. Giants 13 – Lions 3. The game completely changed in the second half as the Lions scored 17 unanswered points to take a 20-13 lead. Detroit dominated the line of scrimmage and the Giants were unable to run the football and Manning was under constant pass pressure. The Giants did not gain a single first down on their first five possessions of the second half. Worse, Manning was sacked in the end zone for a safety. After a 50-yard punt return by the Lions, Detroit cut the score to 13-10 with an 8-play, 30-yard drive. Both teams exchanged punts and then the safety occurred as New York led by only a single point, 13-12. Momentum completely swung in Detroit’s favor as the Lions drove 63 yards in nine plays after the safety to go up 20-13 with the touchdown and successful 2-point conversion with under 12 minutes to play. New York went three-and-out on their next two offensive possessions. With just over five minutes to play, the Lions faced a 3rd-and-7 from their own 22-yard line. Stafford’s pass was tipped by the intended receiver and intercepted by S Will Hill who returned it 38 yards for the tying touchdown, 20-20. Detroit went three-and-out. The Giants picked up one first down (their first of the second half) and punted. The Lions then picked up a first down and were forced to punt after another sack by Kiwanuka. With 50 seconds left in regulation, the Giants had the ball at their own 37-yard line and a chance to win. After two plays, the Giants crossed midfield, but with 28 seconds left, Manning’s deep pass over the middle intended for Jernigan was badly overthrown and intercepted. The Giants won the coin toss and received the ball to start overtime. RB Michael Cox returned the kickoff deep out of the end zone for 56 yards to the Giants’ 49-yard line. After a 15-yard pass from Manning to TE Brandon Myers, RB Andre Brown fumbled the ball away. The Lions recovered at their own 28-yard line. The Giants’ defense held as Detroit went three-and-out. 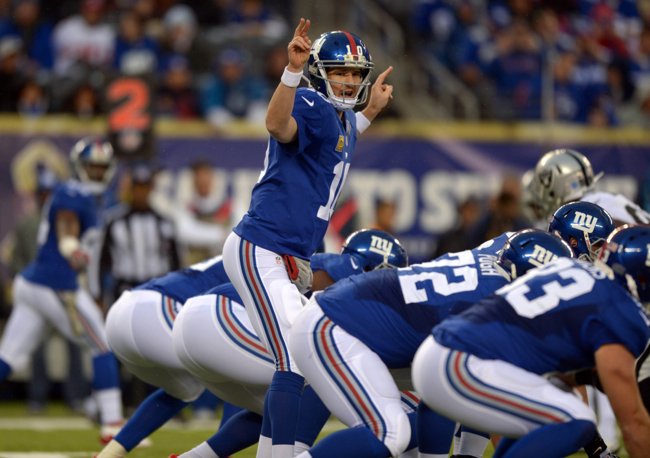 The Giants then put together their final game-winning field-goal drive, marching 45 yards in 11 plays. The huge play on the drive was a 15-yard pass from Manning to Jernigan on 4th-and-7 from the Lions’ 42-yard line. Four plays later, Brown nailed the 45-yard field goal for the win. Offensively, the Giants were held to 238 net yards passing and 41 net yards rushing. Manning finished the game 23-of-42 for 256 yards, 1 touchdown, and 1 interception. His leading receiver was Jernigan who caught six passes for 80 yards and a touchdown. Andre Brown was held to 40 yards on 16 carries (2.5 yards per rush). Defensively, the Giants allowed 207 net yards passing and 148 net yards rushing. The leading tacklers were LB Jon Beason (11), S Ryan Mundy (10), and Hill (9). Hill intercepted a pass that he returned for a touchdown. Kiwanuka had 6 tackles, 2 sacks, and forced a fumble that Rolle recovered. On special teams, the Giants gave up a 50-yard punt return but Cox also had a 56-yard kickoff return. Brown made all three of his field goal attempts from 41, 52, and 45 yards. Post-Game Injury Report: TE Adrien Robinson sprained a knee on the opening kickoff and did not return. Brandon Mosley, who started at right guard, broke a hand on the opening drive and did not return. 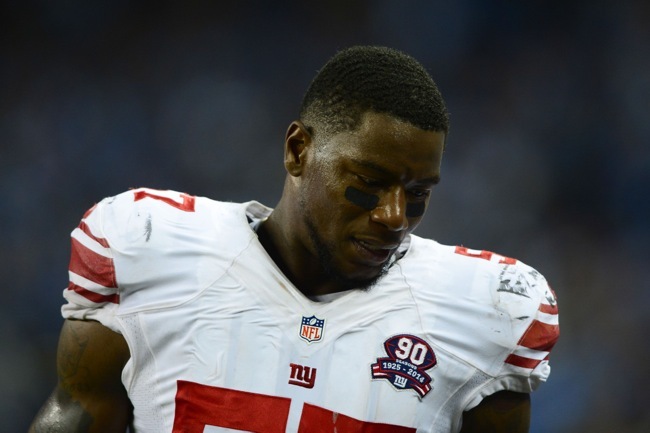 RB Andre Brown suffered a concussion in overtime and did not return. Head Coach Tom Coughlin’s Post-Game Press Conference: The transcript of Head Coach Tom Coughlin’s post-game press conference is available at Giants.com. New York Giants Post-Game Notes: Inactive for the Giants were QB Ryan Nassib, RB Peyton Hillis (concussion), WR Victor Cruz (knee), OG David Diehl (knee), DE Jason Pierre-Paul (shoulder), LB Allen Bradford, and S Cooper Taylor (hamstring). New York Giants Sign CB Ross Weaver to Practice Squad: The Giants signed CB Ross Weaver to the Practice Squad on Wednesday. November 27, 2013 New York Giants Injury Report: Not practicing on Wednesday were DE Jason Pierre-Paul (shoulder), CB Terrell Thomas (knee), CB Trumaine McBride (groin), and RB Brandon Jacobs (knee). WR Hakeem Nicks (abdomen) and CB Corey Webster (ankle) practiced on a limited basis. November 27, 2013 Tom Coughlin Press Conference: The transcript and video of Head Coach Tom Coughlin’s Wednesday press conference are available at Giants.com.